Alito (Agenzia Fides) - An agribusiness project, with a professional training school dedicated to the agriculture and breeding sectors: this is the initiative desired by Alito, in the diocese of Lira, in northern Uganda, by the local Bishop Mgr. Giuseppe Franzelli, and realized with the NGO "Africamission cooperation and development", which has been working in the country for many years, continuing the work of its founders, the missionary Don Vittorio Pastori and Mgr. Enrico Manfredini. Until 1986, the facility now used for the professional training of young people, was a small village-leper colony run by the Comboni nuns with German doctors; now it has been converted and houses classrooms, laboratories and a kitchen. 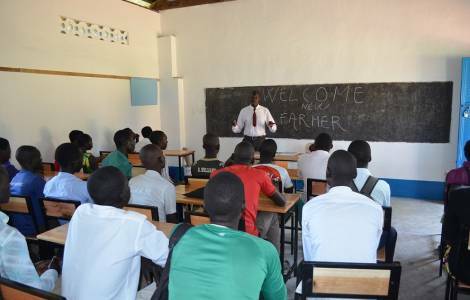 The free agribusiness school, set up for the training of young farmers and breeders, opened last October and will train about 50 young people between the ages of 18 and 25 each semester for three years. "The purpose - explains to Agenzia Fides Piergiorgio Lappo, who is following the project for the NGO in Alito - is to help young people who have cultivable land but who cannot live on their work because of low productivity and difficulties in market access". In a country with a predominantly agricultural vocation and in which young people under 30 represent over half the population, providing theoretical and technical tools necessary to improve land cultivation and livestock breeding represents a concrete way to develop human and natural potential of the territory. "The students of this semester, 40% girls and 60% boys - continues Lappo - are young people from the surrounding areas who have left school and who cultivate family fields. Every morning they come to the center to first take short theoretical lessons in class and then put the teaching into practice by cultivating the field. Everything they learn from this course they then put into practice in their family land". The teachers are all experts of the place, the teaching is almost totally in the local language. In addition to the technical subjects, there is also the teaching of the English language and civic education to ensure a complete training that can make children able to manage their family business. At the end of the semester, young farmers and breeders will be followed by a group of "facilitators", who will help them in the planning of work and will promote the creation of small networks so that they can exchange experiences and techniques. "The most common difficulties - concludes the contact person of Africamission in Uganda - consist in the fact that about 40% of the product, once collected, does not reach the markets. The government is helping, by building new roads that facilitate sellers and buyers to reach the areas where the market is held".